If you have ever shopped for leather or hide you probably know that their thickness is usually given in ounces. If you are confused how leather ounces translates into thickness, it's actually quite easy: One ounce is equal to 1/64 of an inch in thickness. So, for example, if the weight of a piece of leather or hide is said to be 4 ounces, that would mean you multiply 1/64 by 4, which would equal a thickness of 4/64 of an inch. Reducing the fraction down to the lowest common denominator, our example piece is 1/16 of an inch thick. Since leather and hide often varies in thickness - even if it has been processed to make it more uniform - the weight might be given in a range, something like "4 to 4.5 ounces." 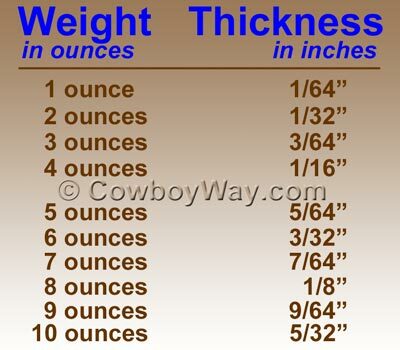 Below is a handy chart converting ounces into thickness for leather or hides. A USA quarter is approximately 1/16 of an inch thick, which is the same thickness as a 4 ounce piece of leather.